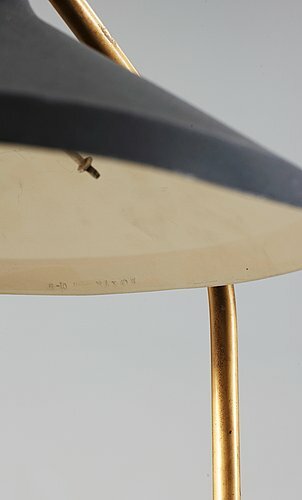 A Greta Magnusson Grossman 'G-10' black lacquered metal and brass floor lamp by Bergboms, Sweden 1950's. The shade stamped G-10 BERGBOM MAX 40W. Height 160 cm. Screw at the hinge missing, wear, part missing inside the shade. Evan Snyderman & Karin Åberg Waern (ed), 'Greta Magnusson Grossman - a Car and Some Shorts - One Architect's Journey from Sweden to Southern California', Arkitekturmuseet, Stockholm 2010, see the model depicted from 1953.